PLEASE WATCH OUR 2 MINUTE VIDEO ABOVE TO SEE WHAT WE ARE ALL ABOUT! This is a question our founder Cindy gets all the time and for good reason! She penned her brand after her two children, Sasha and Nicholas. A business woman and dentist at the time she created Sasha Nicholas, Cindy had a thriving dental practice in her own name and wanted her new company to have a distinct identity separate from her medical career. Knowing that she wanted to build a brand that would transcend generations, the name Sasha Nicholas was a beautiful and meaningful way to represent that intention. Always a maker, Cindy took trips to historic ceramics factories in England, France, and Italy while studying at Oxford University as a young adult which gave her both the inspiration for and an unwavering desire to translate great art, culture and design into her growing passion for meaningful dinnerware and gifts. While raising her children, Cindy installed her first kiln and began creating custom pieces for family and friends. In 2012 she took the leap and began selling hand painted champagne buckets and platters through retail stores and online. 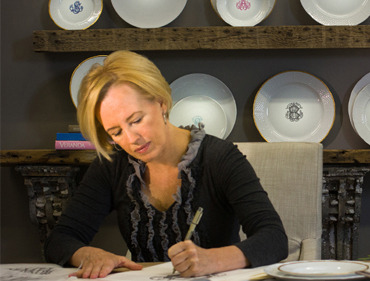 Cindy quickly realized that creating meaningful dinnerware and gifts fed her soul and initiated the necessary steps to sell her practice and devote herself full time to creating and entire line of porcelain dinnerware which she launched in April of 2015 to rave reviews. Before Cindy created Sasha Nicholas, she practiced dentistry. A recent past president of the Greater St. Louis Dental Society, Cindy is still an active delegate to the Missouri Dental Association. As a dentist, Cindy was on the executive board of the dental charity organization Give Kids A Smile and participated in numerous medical missions to Honduras and the Dominican Republic. Cindy’s formal education included study at St. Peter’s College Oxford University (where she developed an obsession for dishes and their making) and received her Doctor of Dental Medicine from Washington University, Saint Louis. She lives in an early 1900’s stone cottage in Saint Louis, Missouri with her love David and their two lively dogs Max and Moses. When she isn’t designing and making, she is busy checking out vintage & second hand shops & antique markets hoping to discover her next treasure.